« John Thurston Passes. . . I want to thank Sensei George Mattson for his trust in me to carry on the IUKF as president. Along with this position comes a huge responsibility involving fairness, compassion and understanding while keeping in mind our enormous affiliations throughout the world. We must also maintain our insistence to all rules and guidelines with no exceptions. Every effort will be utilized to grow and to advance the IUKF. As expected small changes will be announced. Please follow our posting on our website. I appreciate all the well wishes I’ve received and look forwards to working with all our dedicated members. I would also like to announce the IUKF is an official 501-C3 organization which means we are a non-profit organization and all funds forwarded to the IUKF could be tax deductible. As President, I have been a businessman owning and operating businesses for over 30 years. Our Secretary Mario Rizzo is an attorney at Law who will address all our legal issues. Andrew Fink is a CPA with an abundance of experience dealing with the IRS and well versed with “non-profits”. The IUKF thanks you for your support through the past years. We hope to maintain our relationship as the torch is passed and continue to help grow and improve the legacy of Sensei George Mattson our Grandmaster. Yee sensei, I wish you the best in your new role as President of IUKF and to Mattson Sensei, thank you for your years of dedication to IUKF. The best to both of you. 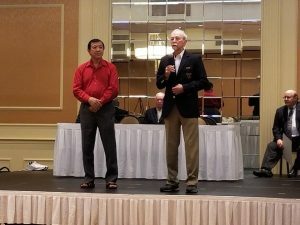 Congratulations to Sensei Darin Yee for being appointed as the new President of IUKF. Master Mattson certainly made the right decision and a great choice. A little bit on Darin: I have known Darin for many years. He is extremely enthusiastic in martial arts and is a man of integrity and honor, besides, he is as nice a guy as can be and can be counted on to help when needed. Besides many years of practicing Uechi Ryu, Darin also studied Kung Fu in Boston Chinatown when he was very young and still practicing it. Darin is very active in several major Chinatown associations. He is an owner of a successful construction company in Boston and also has his own Uechi Ryu dojo in Plymouth. For many years up until recently Master Mattson held his Summerfests in Darin’s huge Jungleflex in Plymouth, Mass. I am sure Darin will be very successful on managing and expanding the IUKF organization and I wish him the best. Let us all give him our support. Master George Mattson will stay on as the Senior Advisor to IUKF and will continue to hold the Winterfests and operate his virtual dojo. He is also a golf guru so he will be busy as usual. As we all know, Master Mattson is the first American who brought Uechi Ryu to America at the urging of Grand Master Kanei Uechi. Master Mattson spent most of his life teaching Uechi Ryu. At one time he had the biggest Uechi Ryu dojos in Boston. He contributed to the huge success of making Uechi Ryu a major karate style in the world today and has taught literally hundreds if not thousands of black belts and some of the well known Uechi Ryu masters today were his students. I wish to congratulate Master Mattson on his life time achievement and wish him a long and wonderful semi-retirement.